She's Fantastic: DC Universe FIGHTING FIGURES! When Mattel worked us into a frenzy back in 2007 with the beginning of their DC Universe toylines, there were several major series' in the works. 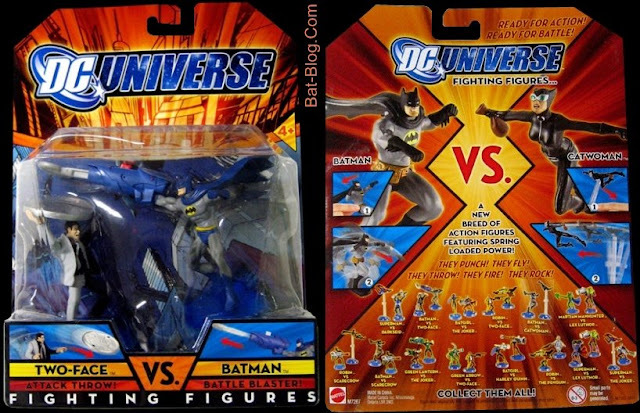 The first was the amazing DC Universe Classics, the second was the promising DCU Infinite Heroes, the third was the impressive DCU Giants of Justice, and the red-headed stepchild of the group was DCU Battleague, later renamed DCU Fighting Figures. The Fighting Figures were 3" tall miniatures with some sort of action feature involved. The best ones just involved a spring-loaded "pouncing" action unobtrusively worked into their base. The lamer ones carried gigantic projectile-launchers that were larger than the figures themselves. It wasn't the best series. But I do love the 5 figures I have in my collection. Series 1 gave us a gray-suited Batgirl and a "divebomb" Catwoman. The second series was cancelled, but contained a Harley Quinn, a black-suited Batgirl, and a whip-wielding Catwoman. Their cancellation was unfortunate, but probably opened the doors for the other DCU Small Scale figures, Battle League, to emerge in their place. I'll start out with an image of the packaging for Series 1. This image is taken from Bat-Blog. click the image to go to the website and check out the solicit photos for all of Series 1. I chose this image in particular because it shows the back of the packaging. You'll see the bottom row of figure pictures shows all of the unreleased Series 2. I will start with the Series one (gray) Batgirl. This figure features the Spring-loaded "attacking" feature I mentioned above. Basically pull back on her body and she'll snap back to this position, essentially punching her opponent. She came packaged with the Joker who had a gigantic mouth gun that shot out a tongue. All of these figure suffer from paint application problems. For the most part they're pretty nice, but the lines are almost always sloppy. Next up is the Series 2 Unreleased (black) Batgirl. Mine unfortunately has no orange highlights in her hair, but considering this is the only painted prototype of her I've ever seen, I won't be too picky. This Batgirl was supposed to have a giant gun of some sort mounted on her forearm. Mercifully though, mine was never attached. Next up will be the Series 1 (divebomb) Catwoman. She doesn't photograph too well, but she's actually a great figure in a great pose. She came packaged with a Batman figure and she looks awesome diving at her opponents. Next up is the Series 2 Unreleased (whip-wielding) Catwoman. This figure is actually decent, except for the ridiculous thickness of her whip. It looks like she's holding a tree or an anaconda. Lastly, we have the Series 2 Unreleased Harley Quinn. Harley was scheduled to be released with the Series 2 Batgirl shown above. She also was supposed to have a large weapon mounted on her forearm. The only difference is that mine came complete and I opted to slice it off with an Xacto. See the black rectangle on her arm? There was a large tab molded onto her arm that was anchored in the gun. I know it's shameful to alter such a rare piece, but the Batgirl was incomplete too and I certainly don't fault her for it. If anything I just leveled the playing field! 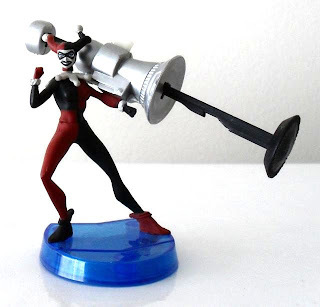 Here's a pic of Harley with her ridiculous weapon. Okay, time for some Group Shots!